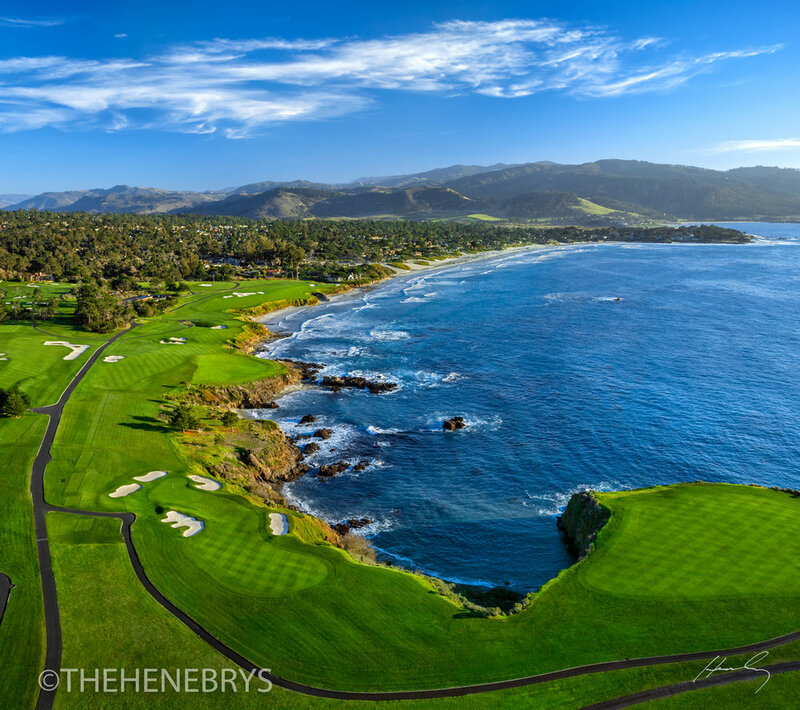 Pebble Beach — The Henebrys - Premier Golf Course Photographers, John Henebry and Jeannine Henebry. Widely regarded as one of the most beautiful courses in the world, Pebble Beach hugs the rugged coastline and has wide open views of Carmel Bay, opening to the Pacific Ocean on the south side of the Monterey Peninsula. In 2001, it became the first public course (i.e. open to the general public for play) to be selected as the No. 1 Golf Course in America by Golf Digest. The Lone Cypress — recognizable the world over as Pebble Beach's iconic trademark, is a Monterey cypress tree in Pebble Beach, California. Standing on a granite hillside off the 17-Mile Drive. Possibly as old as 250 years, the cypress has been scarred by fire and has been held in place with cables for 65 years. Depending on the wind, # 07 the109 yard Par 3 could be anything from a soft sand wedge to a hard 6 iron. The green is small and guarded by a series of bunkers with the daunting ocean to the right and behind the green. One December this storm cleared just in time for gorgeous sunset light to pour over the green. #08 is one of the greatest second shots in golf, the approach is over the ocean to a small green, which slopes to the dramatic cliffs. Dawn light enhances the drama of this scene. The 18th hole is a medium length par 5 (about 550 yards) with Pacific Ocean all along the left. What may be the greatest closing hole in golf was originally an unremarkable par 4. In 1922, William Herbert Fowler added almost 200 yards to the hole. This unique hole also features a tree in the middle of the fairway and a long 100+ yard bunker running along the ocean from the green, guarding the left side. This breathtaking aerial shot of Pebble Beach Golf Links shows the sixth, seventh and tee shot of the eighth holes on Arrowhead Point. The 10th at Pebble Beach is pictured in this dramatic aerial photograph. Depending on the wind, #07 the 109 yard Par 3 could be anything from a soft sand wedge to a hard 6 iron. The green is small and guarded by a series of bunkers with the daunting ocean to the right and behind the green. This view and sky makes you want to linger on the green. The 9th and 10th holes at Pebble Beach are pictured in this dramatic aerial photograph. This dramatic aerial shows the spectacular Pebble Beach Resort. #08 is one of the greatest second shots in golf, the approach is over the ocean to a small green, which slopes to the dramatic cliffs. Shot from a lift truck this shot dramatizes the Bay and large breakers rolling in. #17 typically plays right into the wind and is protected by massive bunkers. I don’t believe there is an easy pin location on the hole. Depending on the wind, #07 the 109 yard Par 3 could be anything from a soft sand wedge to a hard 6 iron. The green is small and guarded by a series of bunkers with the daunting ocean to the right and behind the green. One December the tide was unusually high which is called King Tide by locals. Don’t be distracted by the view! The ocean runs the entire length of the right side of the hole. From the new championship tee what a beautiful scene of Carmel Beach and high surf pounding in. Depending on the wind, #07 the 109-yard Par 3 could be anything from a soft sand wedge to a hard 6 iron. The green is small and guarded by a series of bunkers with the daunting ocean to the right and behind the green. One December this storm cleared just in time for gorgeous sunset light to pour over the green. One of the greatest closing holes in golf—this is a reverse shot of Pebble Beach #18. Large waves crash on the walls to the left of the green. The signature hole at Cypress Point Club is #16, which requires a 231-yard tee shot over the Pacific to a mid-sized green guarded by strategically placed bunkers—rightfully considered one of the hardest holes in the world of golf. The ocean runs the entire right side of the hole. A par here is a great score.